Symbiodinium D, a relatively rare clade of algal endosymbiont with a global distribution, has attracted interest as some of its sub-cladal types induce increased thermal tolerance and associated trade-offs, including reduced growth rate in its coral hosts. Members of Symbiodinium D are increasingly reported to comprise low-abundance ‘cryptic’ (<10 %) proportions of mixed coral endosymbiont communities, with unknown ecological implications. Real-time PCR (RT-PCR) targeted to specific types is sufficiently sensitive to detect these background symbiont levels. In this study, RT-PCR was employed to screen 552 colonies of the key Caribbean reef builder Orbicella annularis sampled across a 5.4 million km2 range for the presence of cryptic Symbiodinium ‘D1a’ (i.e., the principal Caribbean ITS2 variant, also known as D1-4). All but one out of 33 populations analysed were shown to host low abundances of Symbiodinium D1a, with an average of >30 % of corals per site found to harbour the symbiont. When the same samples were analysed using the conventional screening technique, denaturing gradient gel electrophoresis, Symbiodinium D1a was only detected in 12 populations and appeared to be hosted by <12 % of colonies where present (in agreement with other reported low prevalence/absences in O. annularis). Cryptic D1a showed a mainly uniform distribution across the wider Caribbean region, although significantly more Mesoamerican Barrier Reef corals hosted cryptic D1a than might be expected by chance, possibly as a consequence of intense warming in the region in 1998. Widespread prevalence of thermally tolerant Symbiodinium in O. annularis may potentially reflect a capacity for the coral to temporarily respond to warming events through symbiont shuffling. However, association with reduced coral calcification means that the ubiquitous nature of Symbiodinium D1a in O. annularis populations is unlikely to prevent long-term declines in reef health, at a time when maintaining reef growth is vital to sustain reef ecosystem function. 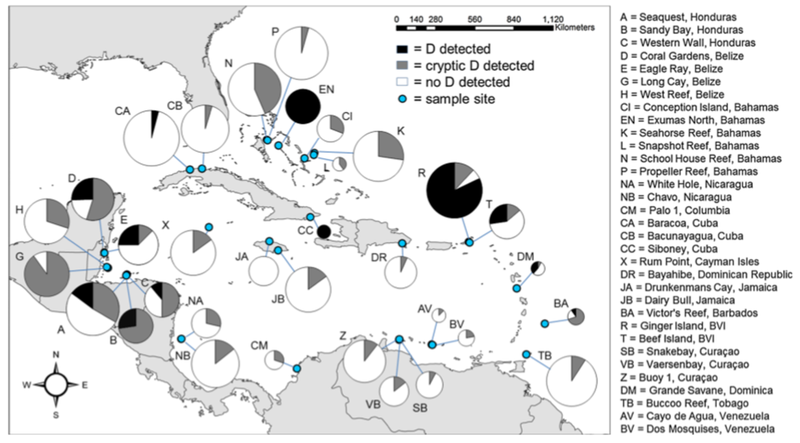 Pie charts show the number of Orbicella annularis (mountain star corals) hosting thermally tolerant Symbiodinium D1a across 33 sites (blue dots, letters) across the Caribbean. Black shading shows the D1a detected by traditional screening technique ('DGGE'), the grey shading reflects 'cryptic' D1a that was detected at low levels using sensitive technique ('RT-PCR'). The large number of corals with low levels of D1a makes us hopeful that these corals have a capacity to be resilient against bleaching stress.